During the season of giving, shoppers really need all the money saving hacks they can get. A good place to start hacking your spending may actually be one of the first places where you start the day: Starbucks. Even though the coffee chain quietly raised prices on many of its drinks this summer, there are several ways consumers can cut down on costs when ordering their favorite drinks. Some of these hacks are stealthy, but others are simply delivered straight to your email inbox. Whether you're a piggy bank ninja or a frivolous spender, it doesn't hurt to brush up on the many ways to enjoy your favorite holiday drink or freshly brewed Sumatra blend for a little less during this time of year. 1. Become a Starbucks Rewards member. Signing up for Starbucks Rewards is simple. If you've ever used the Wi-Fi while sitting in a Starbucks or received and registered a new gift card, you are actually already a member. The cafe's rewards card earns you stars (two stars per $1 spent), and when you reach 125 stars (that's a flavored grande latte once a day, for two weeks), you'll receive a beverage on the house! 2. Grab a drink during happy hour. When you sign up online, Starbucks will send you email notifications about its weekly happy hour (they usually happen Thursdays and start at 3 p.m. local time). Deals range from buy-one-get-one-free to 50 percent off chosen beverages. 3. Stay for a cheap refill. 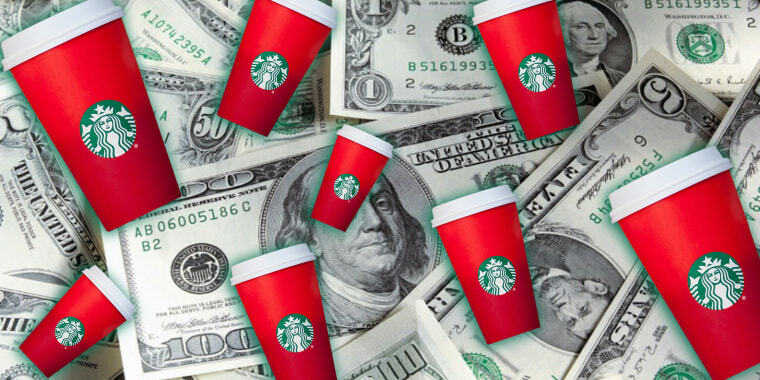 Did you know Starbucks will refill your drink for just 50 cents? Whether you get a hot tea or a fancy holiday drink, the baristas will refill freshly brewed coffee or tea drinks to the brim ... as long as you've stayed inside the store. Another tip, if you're a Rewards member, you won't be charged a dime. Just be sure to have a physical card or the app on your phone so you can prove you're a true insider. 4. Buy yourself a shortie. If you like your coffee short and sweet, this deal is for you. On Starbucks' secret menu, there's a size smaller than tall ... and it costs less. According to Business Insider, the short used to be the chain's only other size besides tall when the coffee shop first got started in Seattle. As it expanded, it added larger cups, and although the short was phased off the main menu, baristas still have it for tried-and-true customers. 5. Save with a reusable cup. Let's face it: Some people may still be mad about that free red reusable cup they never got from Starbucks earlier this month, but this deal will hopefully bring some cheer. Take a reusable cup to fill up and get 10 cents off your beverage order. And don't worry, any cup will do. 6. Take the beans home with you. This option may seem obvious to many coffee lovers, but for those truly devoted to Starbucks' bold brews, just grab a pound of the store's signature beans to get the same flavor of the coffee you love for a more reasonable price brewed at home. Starbucks' coffee beans are available at most of its cafes and at many large grocery stores. You'll be thrifty and your house will smell like Starbucks in the morning. Now just one question remains: What are you going to do with all that extra coffee change you've saved?